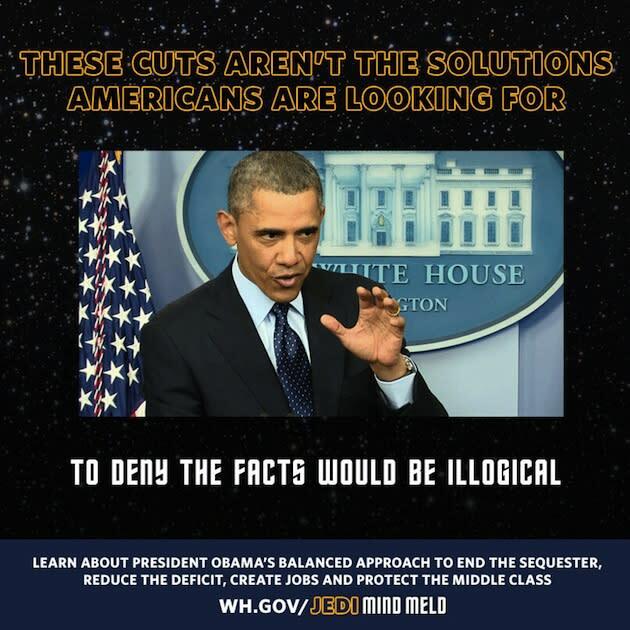 President Barack Obama may have drawn a bit of nerdly wrath on Friday by saying he couldn't just "Jedi mind meld" Congress into agreeing to compromise to avoid painful spending cuts known as sequestration. Obama committed what people who show up to movies two weeks early and in homemade Stormtrooper costumes may consider a cardinal sin: giving the Jedi of Star Wars a skill attributed to the Vulcans of Star Trek. Twitter erupted, highlighting the entirely unsurprising reality that inside-the-Beltway types take their sci-fi seriously—though not, evidently, as seriously as some. Hey, it beats trotting out Press Secretary Jay Carney in a gold bikini. When it comes to turning a minor gaffe into a political asset, though, Rubio shot first!